Private Cabin with 1 Queen Bedroom and an additional Queen Bed Loft. Our Private Wood Cabin is nestled in the woods with its own private driveway and creek. It has all of the modern amenities and luxuries of modern day living, and is nice and cozy for up to 5 people. There is one private bedroom, and a loft bedroom both with queen beds, as well an oversized sectional couch with a chaise. All of the furnishings and inside of the cabin are new and comfortable. 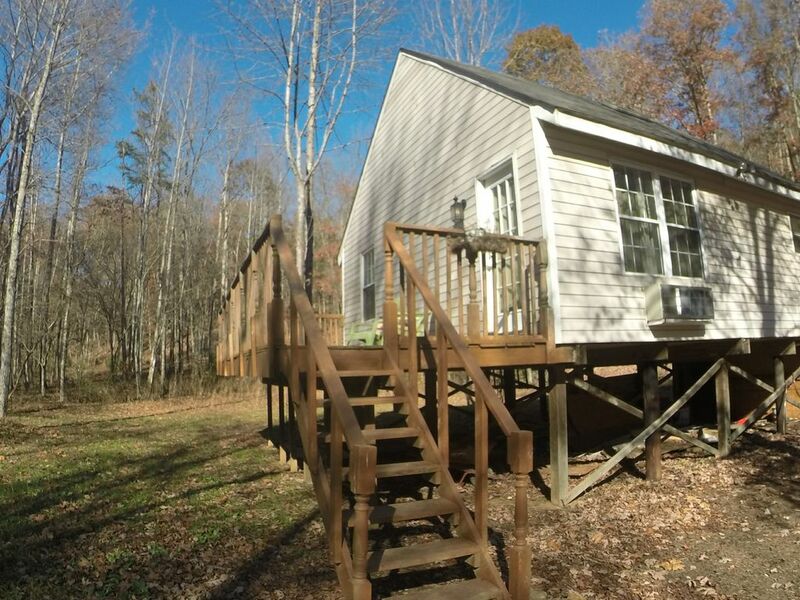 The cabin is located approximately 10 miles from the South side Smith Mountain Lake by car, and a couple minutes walk to the Pigg River for some Bass fishing (although you will have to bring your own pole). We are situated on our own 12 acres that is attached to over 180 acres of untouched forest, so usually is plenty of wildlife and beautiful scenery no matter what time of year you visit. If you want to get away from it all, sit back, relax, and enjoy nature, this is the cabin for you! We are always available if you have any questions. I am retired military, and my husband is in law enforcement. We are honest, hardworking people with a zest for life and adventure. This cabin is cute. Perfectly hidden in the woods, yet close to everything you need. Clean, comfortable we truly enjoyed our stay. Enjoyed a nice quiet getaway! We truly loved your cabin and just Loved the Peace and quietness with an abundant privacy with a well rested sleep. We really enjoyed our stay at the cabin. The inside was very cozy and had everything we needed. It's a nice little place to connect with nature and get away for a while. If anyone is looking for a secluded area with no neighbors, this would be a great place. We liked the fact that it is still relatively close to Rocky Mount, Danville and Roanoke. And if the weather was warmer, Smith Mountain Lake is nearby also. We do welcome pets to our home, but we will need proof that your pet is flea free before they can stay. The proof can be a letter from at veterinarian that states that the pet is on medication for fleas, and is flea free. I am sorry if this is an inconvenience, but we want all guests to have a pleasurable stay in a flea free home. If it is found that you have a pet that was not registered, and the pet fee was not paid, you will be charged the pet fee, and responsible for any flea's found after your stay (as they can live months before hatching).